THE IRISH FESTIVAL reached its climax yesterday with the annual parade from the Irish Centre on Queens Rd, off Cheetham Hill Road, to the Town Hall where, just like last year, there was an Irish market, selling souvenirs, craft items, books and groceries and lots more. A bearded fortune teller who looked like he'd dropped in from AD 699 read palms, and Irish music and dance were performed on a small stage. Ferry company Stena Line had a trailer promoting their services to Ireland and the continent. Irish number plates and accents were much in evidence at this family-orientated and nowadays quite multicultural event: grannies, grandads, kids, parents, uncles and aunts wore shamrocks and Irish tricolours, and the sound of Irish accents mingled with French German and Japanese voices. Inside the Town Hall on the first floor, there was an Irish cafe serving traditional style food - around £4 per serving, delicious if a little on the small side. Down the hall, the Irish bar served Guinness (£2 a pint - I thought they said it was going to be £1.50) and Boddingtons (£1.90). Queues were long, but the catering department did a good job under the circumstances. 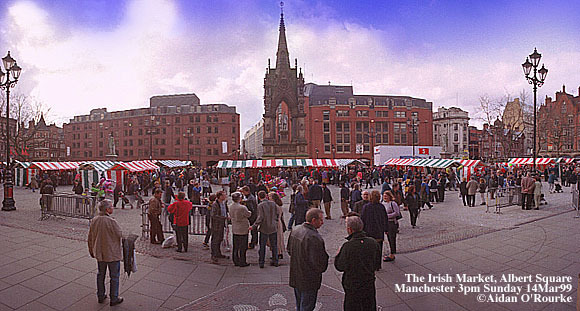 And St Patrick's Day hasn't even happened yet - Wednesday's the big day - so there are still plenty of opportunities to enjoy "a bit of craic" Manchester-style. PLANS FOR THE NEW EXCHANGE SQUARE, which is overlooked by the Corn Exchange and the new M&S building, have been revealed: Opposite the Corn Exchange, on the Arndale frontage, there will be a department store. Round the corner, on Withy Grove, there will be shops. Cannon Street will be turned into a glass covered "winter garden" (but we knew this already) with access after normal shopping hours. 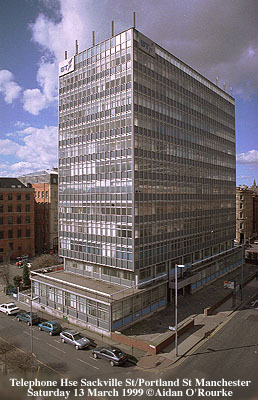 The Arndale tower (currently empty) will be accessible from Exchange square, and may be converted into offices or a hotel. 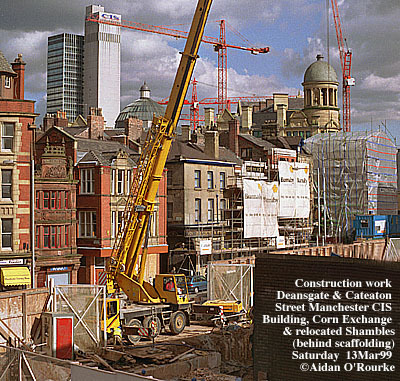 DOWN ON DEANSGATE, work is in progress to transform the Great Northern Goods Warehouse into a state-of-the-art leisure and entertainment complex. At the top end, fronting onto Peter St, a new piazza is being created. It'll open at the end of May. Already a wedge-shaped glass building has appeared on the Peter St/Watson St corner, and on the Deansgate side, a razor-like corner tower looms over the Deansgate/Peter St junction - pictures coming soon. Oh, and across on the other side of Watson St, next to G-Mex, and the new convention centre, a 12-storey office building will arise soon. So where once there were railway carriages, cranes, canal barges and horse-drawn carts, there will soon be families on days out, office executives, cinemas, cafes and cappucinos. 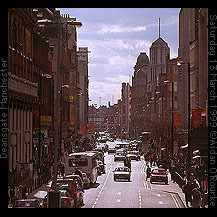 There's a picture of Deansgate, taken from the footbridge near the Cathedral (soon to be demolished - the footbridge, not the cathedral!) lower down the page. UP IN BLACKLEY, a new development is planned by Zeneca, whose office tower dominates the area. 500 new homes are to be built on disused land, along with recreational facilities, a business park and a footpath along the Irk Valley. But elsewhere in Manchester, things aren't looking so promising: the City Council faces a £1bn bill for repairs to its housing stock. It's hoped the New Deal for Communities will bring regeneration to communities east Manchester, who have some of the worst housing in the conurbation. TAMESIDE MUSEUM has re-opened after a two year refurbishment. It's housed in a restored mill at the old Ashton Canal Basin, and I'll be getting down there soon and taking some photos when I have a spare moment. ELK MILL in Royton is to be demolished, it was announced today the MEN's business section. Britain's last spinning mill - constructed in 1925, will be pulled down to allow expansion of a neighbouring retail park. I'd better scoot up there soon with my camera before it's too late. And the building on the right is also going to disappear, if recent reports are accurate. This is the view of Telephone House from the top of the Chorlton St multi-storey car park. It's to be removed to make way for a new hotel. 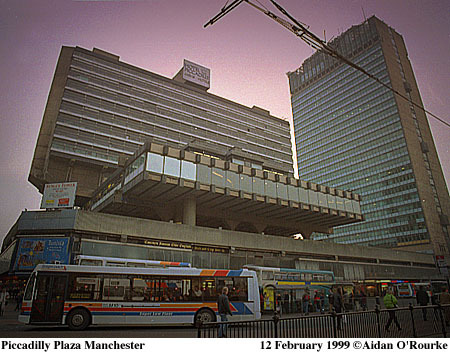 THE MANCHESTER CIVIC SOCIETY is inviting entries for the 1999 Civic Society awards, which are sponsored by the Manchester Evening News and Norweb. The Civic Society, under the persuasive chairmanship of Carolyn Blain, has managed to secure a very high profile guest for the awards ceremony, none other than Heritage secretary Chris Smith. The awards lunch will take place at Manchester Town Hall on the 20th of April, tickets £35. More details on the Civic Society website. And I've been informed that Eyewitness in Manchester is to be entered for the "Spirit of Manchester" award. If you'd like to express your support, or wish to submit an entry of your own, e-mail Carolyn Blain. LOCAL GOVERNMENT is about to be transformed by a change to a cabinet style of doing things, and away from committees. 230,000 leaflets have gone out to households in Manchester asking people for their views. 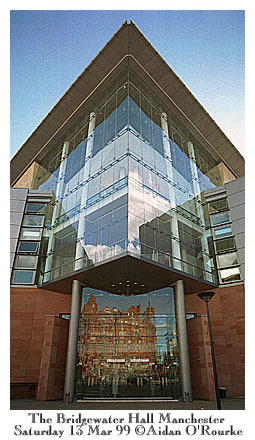 The City Council website is at www.manchester.gov.uk. MORE CITY CENTRE RANGERS are to be recruited by the Council. With their smart uniform and blue and white brollies, they've been a great success since they started giving help and advice to visitors five months ago, and more people are sought. The scheme is part of the New Deal, and targets long term unemployed in the 18 to 24 age range. A GOVERNMENT COMMITTEE visited Manchester today and was urged to provide government support for the Commonwealth Games, to be staged here in 3 years time. The Council faces a huge bill for putting on the Games, which they consider to be a national event, and therefore should be supported by central government. TRAFFORD BOROUGH COUNCIL has won the "Best Council in Britain" award, which councillors from the borough received at an Oscar-like ceremony in London. But Altrincham and Sale Tory MP Graham Brady said he was astonished at the news, and has accused the Labour-run council in Trafford of wasting money and increasing charges. THE PAPERLESS TOWN HALL is still a dream, though deputy leader of Manchester City Council Martin Pagel has signed up to the government-sponsored Planet Pledge 2000 campaign. As part of his personal pledge, he'll be refusing to accept any documents printed on glossy paper on one side. Well, I can guarantee, no extra trees have been consumed in the making of Eyewitness in Manchester this week! THERE WAS A POSTAL strike in Manchester on Friday, which caused delays - I've been hand-delivering my invoices recently to ensure they arrive on time! Here's the classic new oval-shaped sign at the main post office on Spring Gardens. TUESDAY'S BUDGET sounded on first hearing like a huge give-away, with tax cuts, and increases in benefits for disadvantaged groups. But, as they used to say "You don't get owt for nowt" - there are many rises elsewhere, the most visible on the street of Manchester being a 4p a litre hike in the price of petrol. 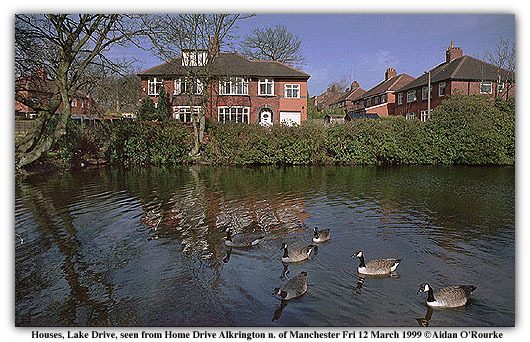 At most stations to the south of Manchester, it jumped overnight from 60.9 to 64.9. To the north the cheapest price is generally a penny cheaper. Diesel has also gone up, which it's claimed, will hit many road haulage companies in the north west. "OFFENDERS AND THEIR FAMILIES are often treated better than victims", said Marjorie Larose, 78, who was brutally attacked by two youths last year. Constroversy has been sparked by two unrelated news items: a court decision allowing lawyers representing the two killers of Jamie Bulger to appeal to the European Court, and a lottery award of £440,118 to the Manchester-based Partners of Prisoners and Families Support Group. But Director Farida Anderson defended the work of the group, which provides counselling to more than 1000 families in the central Manchester area. LOTTERY MONEY has gone to a variety of other groups around Greater Manchester including: Henshaw's Society for the Blind, Spurgeon's Childcare Bury, Bury Shopmobility, Pembroke Singers and Bolton Male Voice Choir. And Marjorie Jones aged 69 of Cadishead won £1,038,923 in last Wednesday's National Lottery draw. KENNETH PEATFIELD was jailed for life on Friday for decapitating his common-law wife and encasing her head in concrete. On Thursday, Martin Dott was given a life sentence for murdering his wife and dumping her body in the bath. And Wythenshawe resident Len Devlin is now campaigning to clear the name of his brother Teddy Devlin, who was hanged in 1952 for a murder committed in Liverpool. BRITAIN'S TOP RADIO DJ Zoe Ball broadcast her breakfast Radio 1 show from Manchester Metropolitan University last Tuesday. A giant size advert featuring Zoe has been seen on the back of on buses in Manchester recently. And veteran news broadcaster Peter Snow came to the Trafford Centre to present a Budget Day special. Talking of the Trafford Centrem it is now no longer the biggest shopping centre in Europe: this distinction now goes to the £360m Bluewater Centre, in Dartford, Kent. THE BBC DISCUSSION programme "Question Time" came from Manchester on Thursday, and "Stars in their Eyes" presented by Matthew Kelly started a new run on Saturday. It comes from the Granada Studios complex on Quay St. "City Central", "Queer as Folk" and "Mrs Merton" continue their run. David Beckham, who has said he thinks most people don't like him, will appear in a new programme "The Football Millioniares", on at 10.30 on BBC1 Tuesday night. PERFORMANCES THIS WEEK included Frankie Vaughan, who appeared at a fund-raising concert at UMIST's Reynold theatre on Tuesday. "Romeo & Juliet" was on at the Palace Theatre, "Goodness Gracious Me", the Tokyo String Quartet and the Halle Orchestra were on at the Bridgewater Hall. "Mother of all the Behans" was on at the Capitol Oxford Rd, "Things Fall Apart" was at the Library Theatre, and audiences at the Apollo saw Steps, that well-scrubbed musical fivesome, proteges of Manchester-based pop producer Pete Waterman. The premiere of the movie "The Faculty" will take place at the UCI cinemas at the Trafford Centre soon - Hollywood stars will be in attendance. And one particular American celebrity will be at the Trafford Centre at 11.30am on Thursday - I'm talking about Monica Lewinsky of course. I wonder if she'll be coming to the city centre to do some shopping. Fans queued up overnight for tickets to see Bruce Springsteen, who's playing at the MEN Arena on 1 May. FORMER MANCHESTER UNITED star and "Busby Babe" Dennis Violett died in Florida last week. It's been revealed that Glasgow Rangers were planning to buy "sleeping giant" Manchester City, but decided against it due to UEFA ruling which forbids a single owner from entering more than one club in the same European competition. CLUBBERS are leaving Manchester by the busload and going to Liverpool, Leeds and Sheffield, it's reported. The reason is in part due to the lawlessness of criminal gangs. Club Havana, on High Street (off Market St, opposite the top of the Arndale Centre) has installed a fortress-like battery of defences to prevent trouble-makers from gaining entry. A new strategy to combat crime was launched on Wednesday, with a high profile ad campaign. "The Force Against Crime Just Got Bigger", says the slogan, which introduces the newly created Crime Reduction Partnerships. There will be co-operation between different groups, recruitment of people from the community to fight crime, and a get tough policy on anti-social behaviour. Let's hope it works. A VICAR says he was saved by a divine ring of the bell, when a blaze started in the vicarage of the Holy Trinity Church, Middleton. Early Wednesday, the Rev Matthew Thompson was dozing in bed, when he heard the door bell, went to answer it, but found no-one there. Then he discovered a fire in a spare room. Firefighters later discovered the fire had burned through the doorbell wires, causing it to ring once. 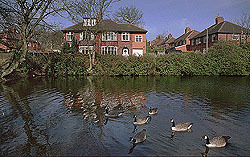 The vicarage is on Wentworth Close, Middleton. A STATUE OF ALAN TURING, famous for his work as a code-breaker in WW2 and devloping the basic principles of the computer program, may not be erected in Sackville Park due to a lack of support by computer companies. Alan Turing, who came from the south of England to work at Manchester University, was prosecuted in the early 50's for homosexuality and later committed suicide. Alan Turing Way, part of the A6010 in Eastlands, reminds us of the eccentric and brilliant thinker who helped to win the war and develop the modern computer. RED NOSE DAY, the national fund-raising event for disadvantaged children in Africa and in the UK, took place on Friday, with further events over the weekend. Around Greater Manchester, as elsewhere in the country, enterprising people subjected themselves to zany trials and tribulations in order to raise money. The non-stop tv comedy event went on all evening, and though the cause was good, I didn't find the humour very funny. SUDDENLY MANCHESTER has a spring-like, almost summery feel. Weather like this brings thoughts of childhood days spent down by the stream catching tadpoles, out in the park playing on the slide and swings, at the outdoor swimming pool, or going on bike rides through town and country. Well, I'm hoping to get back on two wheels shortly (pedal, not piston-powered! ), enabling me to penetrate into hitherto unreachable parts of the city with my cameras. Anyone who likes to complain about Manchester's allegedly terrible climate should have been here on Saturday, it was idyllic - and today was very nice too - it was the best of British - (or should I say north west European? ): mild, sunny and temperate. The current EWM temprature is 7 celsius, 45 fahrenheit.